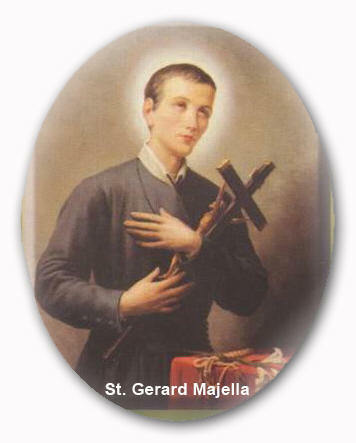 Why is St. Gerard Majella invoked by thousands as "The Mother&apos;s Saint"? It appears strange that a man, and a religious lay brother at that, should be so acclaimed. It might seem that a married woman, who had been blessed with the privilege of motherhood, would be chosen by Divine providence for this office. However, the fact is that the countless favors and prodigies obtained for mothers and their children through the intercession of St. Gerard seem to suggest the role selected for him. Although the Church has not officially proclaimed him the patron of mothers, it is hoped that one day she may do so. During his life he helped mothers in need; since his death, in 1755, there has been a continuous flow of extraordinary favors granted to mothers who prayed to him; today there are millions who look to him for help in obtaining the blessing of motherhood and in the difficulties attendant on motherhood. Gerard, the youngest of the five children of Dominic and Benedetta Galella Majella, was born on April 6, 1726, in the small town of Muro, which is a few miles distant from Naples in southern Italy. He was very sickly at birth and was immediately taken to the Cathedral church for Baptism. Even his childhood was marked by special graces from God. When he was only five, he was accustomed to going to a small chapel near his home to pray. Often he would return home from these visits with a loaf of bread. When asked about this, he would say that "a most beautiful boy" had given it to him. One day his sister, Elizabeth, followed him to the chapel and watched him while he knelt in prayer before a statue of the Blessed Mother holding the Child Jesus. Then she saw a strange thing happen. The Child Jesus left His Mother&apos;s arms and came down to play with the little boy. After some time the Child gave Gerard a loaf of bread and returned to His Mother&apos;s arms. This was something of a prelude to the miraculous event in which the Archangel Michael gave him his first Holy Communion. When Gerard was twelve, the sudden death of his father made it necessary for him to leave school and to begin to work. His mother apprenticed him to a tailor so that he could follow the trade of his father. His employer took a strange dislike to him and often showered him with blows and curses. Gerard accepted the persecution as being permitted by God for his spiritual good. Once he was seen to smile even while he was being beaten, and when asked about this, he said: "I was smiling because I saw the hand of God striking me." After his apprenticeship as a tailor, Gerard served for some time as a houseboy for the Bishop of Lacedonia, who was recuperating in Muro. Again he manifested the virtue of patience by silently bearing the irascible temper of this otherwise worthy man. During this time one of his early miracles took place. One day he accidentally dropped the key of the house in the well. With saintly simplicity, he lowered a small statue of the Infant Jesus into the well. To the amazement of the onlookers, when Gerard raised the statute the lost key was held in its hand. Such a youth would naturally turn toward the religious life. Three times, however, he was refused admittance into one religious order because of his frail health. He was still determined to become a lay brother, and the occasion of a mission conducted by the Redemptorist Fathers in Muro gave him new hope. He asked to be admitted as a candidate in their order but again was refused because they felt that his health would not be equal to the rigors of monastery life. So persistent was the young man, however, that Father Paul Cafaro, the superior of the missionaries, advised his mother to lock him in his room on the night they were leaving Muro, lest he try to follow them. Gerard&apos;s mother did so, but the next morning when she unlocked the door she found an empty bed, an open window from which hung a sheet, and a note on the table that read: "I have gone to become a Saint." Gerard had caught up with the missionaries just as they were leaving town. After many entreaties and refusals, Father Cafaro finally gave in and sent him on to the rector of the Redemptorist house at Iliceto with this note of recommendation: "I am sending you a useless lay brother." The "useless" lay brother was to do the work of four men, according to the testimony of those who worked with him. In his six short years as a Redemptorist, Gerard advanced rapidly in sanctity. His prayer life was continual and his spirit of obedience was so perfect that several times he even appeared at distant places in response to the unspoken requests of his absent superior. Even his confreres came to honor him as a Saint. Much of his life as a brother was spent in traveling with and assisting the missionaries. They deemed him an invaluable companion because he had such remarkable success in bringing sinners to the Sacraments and in inducing many to repair their past bad Confessions. People followed him everywhere, and already called him "il santo" -----the Saint. True sanctity must always be tested by the cross, and it was in 1754 that Gerard had to undergo a great trial, one that may well have merited for him the special power to assist mothers and their children. One of his works of zeal was that of encouraging and assisting girls who wanted to enter the convent. Often he would even secure the necessary dowry for some poor girl who could not otherwise be admitted into a religious order. Gerard was called by St. Alphonsus to answer the accusation. Instead of defending himself, however, he remained silent, following the example of his Divine Master. In the face of his silence, St. Alphonsus could do nothing but impose a severe penance on the young religious. Gerard was denied the privilege of receiving Holy Communion and forbidden all contact with outsiders. It was not easy for Gerard to give up his labor on behalf of souls, but this was a small penance compared with being deprived of Holy Communion. He felt this so keenly that he even asked to be freed from the privilege of serving Mass for fear that the vehemence of his desire to receive would make him seize the consecrated Host from the very hands of the priest at the altar. Sometime later Neria fell dangerously ill and wrote a letter to St. Alphonsus confessing that her charges against Gerard had been sheer fabrication and calumny. The Saint was filled with joy by the news of the innocence of his son. But Gerard, who had not been depressed in the time of his trial, was not unduly elated in the hour of his vindication. In both cases, he felt that the will of God had been fulfilled, and that was sufficient for him. Of few Saints have there been so many wonderful events recorded as of St. Gerard. The process of his beatification and canonization reveals that his miracles were of the widest variety and profusion. He frequently fell into ecstasy while meditating on God or His holy will and at such times his body was seen raised several feet above the ground. There are authentic records to prove that on more than one occasion he was granted the unusual miracle of being seen and spoken to in two places at the same time. Most of his miracles were performed in the service of others. Such extraordinary happenings as the following begin to seem commonplace when one reads his life. He restored life to a boy who had fallen from a high cliff; he blessed the scanty supply of wheat belonging to a poor family and it lasted until the next harvest; several times he multiplied the bread that he was distributing to the poor. One day he walked across the water to lead to the safety of the shore a boatload of fishermen threatened by the stormy waves. Many times Gerard told people of secret sins on their souls which they had been ashamed to confess and brought them to penance and forgiveness. His miraculous apostolate for mothers also began during his lifetime. Once, as he was leaving the home of his friends, the Pirofalo family, one of the daughters called after him that he had forgotten his handkerchief. In a moment of prophetic insight, Gerard said: "Keep it. It will be useful to you someday." The handkerchief was treasured as a precious souvenir of Gerard. Years later the girl to whom he had given it was in danger of death in childbirth. She remembered the words of Gerard and called for the handkerchief. Almost immediately the danger passed and she delivered a healthy child. On another occasion, the prayers of Gerard were asked by a mother when both she and her unborn child were in danger. Both she and the child came through the ordeal safely. Always frail in health, it was evident that Gerard was not to live long. In 1755, he was seized by violent hemorrhages and dysentery and his death was expected at any moment. However, he had yet to teach a great lesson on the power of obedience. His director commanded him to get well if it were God&apos;s will, and immediately his illness seemed to disappear and he left his bed to rejoin the community. He knew, however, that this cure was only temporary and that he had only a little over a month to live. Before long he did have to return to his bed, and he began to prepare himself for death. He was absolutely abandoned to the will of God and had this sign placed on his door: "The will of God is done here, as God wills it and as long as He wills it." Often he was heard to say this prayer: "My God, I wish to die in order to do Thy most holy will." Between midnight of October 15, early morning of the next day his innocent soul went back to God. At the death of Gerard, the Brother sacristan, in his excitement, rang the bell as if for a Feast, instead of tolling it for a death. Thousands came to view the body of "their Saint" and to try to find a last souvenir of the one who had helped them so often. After his mother&apos;s death miracles began to be reported from almost all parts of Italy, attributed to the intercession of Gerard. In 1893, Pope Leo XIII beatified him, and on December 11, 1904, Pope Pius X canonized him as a Saint. Devotion to St. Gerard spread rapidly beyond Italy and throughout the world and he came to be called "the wonder-worker of our day." Because he had so often helped sinners to make a good Confession, he was adopted by many as the patron of a good Confession. Others revere the young apprentice tailor and Redemptorist lay brother as the patron of workingmen. Because he had so much difficulty getting into a religious order and because he sent so many girls to the convent he is often called upon as the patron of vocations.